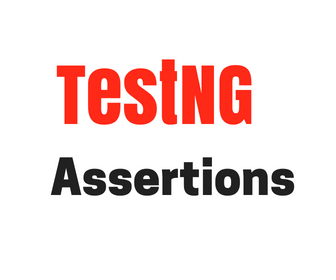 Asserts helps us to verify the conditions of the test and decide whether test has failed or passed. A test is considered successful ONLY if it is completed without throwing any exception. It is the default assert mechanism built into TestNG’s package. We use it when a test has to stop immediately after the assertion fails. It is a custom assert mechanism supported by TestNG’s package. We use it when a test has to continue execution even after an assertion fails in the sequence. Above Test which includes multiple assert calls, all of which get passed and so the test case. In above scenario, the second assert call fails which leads to the end of the test case. You can cross-check from the output , that the message appeared there even after one of the assert calls failed. Test4: An Issue In Using The Soft Assertion. In this example, you can see that there are multiple test cases. They are using the same Soft assertion object. We added it to highlight the issue which occurs when one test failure makes other tests to fail. It happens due to the use of same assert object which evaluates all occurrences of assert methods despite being in different cases. Test5: Right Way To Use The Soft Assertion.